February 19th 1996, BRIT Awards, the British Music Industry's annual awards ceremony, saw the introduction for the first time of a nwq award, The Freddie, a new category intorduced in memory of Freddie Mercury. The Freddie Mercury Award is given in honour of artists or organisations who in the opinion of the BPI council members have made an extraordinary contribution to charitable works or consciousness raising during the previous year. The Freddie award is a statuette in the likeness of Freddie Mercury sculpted by internationally recognised Czech sculptor Irena Sedlecka. Introduced and presented by Roger Taylor, that the 1996 year inaugural award was recieved by Brian Eno and Radiohead's Tom York, for the all-star HELP! charity album, which was recorded in one day and which has already raised 2 million pounds for Bosnian war children. In 1997 Sir Elton John was honoured by BPI and recieved the Freddie Mercury Award from Prime Minister Tony Blair at the White House after Sir Elton’s performance at a Bill Clinton Gala dinner. The British Music Industry felt that his donation of all royalties from Candle In The Wind ’97 - which totalled £20 million was an exceptional gesture which had to be marked by this special presentation. In 1998 the Freddie Mercury Award was given to Jubilee 2000 group, which campaigning for Western banks to cancel Third World debt repayments by the new millennium. 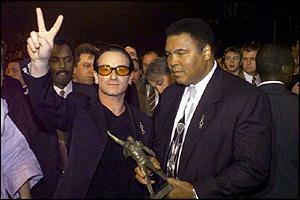 The award was accepted by Muhammed Ali, presented by U2 singer Bono.